Prevention is better than cure, and that applies to spring cleaning as well. Sure, you can set aside valuable time every year to clean out those dusty corners and dirt-filled grooves. Or you can opt for a design that minimizes mess and grime in the first place. How’s how. The way we use our homes affect which areas become grime-magnets. For example, do you have to trek through the whole house when carrying in the groceries? Do the kids cross from one side of the house to the other to get from their rooms to the den? Where do you walk when you come in from the garage? How is your laundry room set up? Where do your pets sleep, play and eat? Minimizing foot traffic by dividing your home into “zones” can keep grime at bay. So can choosing the right finishes for heavy-traffic areas – these can mean fewer scuffs, stains and spills. We spend our days walking all over it. It’s no surprise that flooring gets dirty quickly. But some surfaces carry less of a grime factor than others. Polished concrete is the simplest solution, and it helps keep things cool in the Texas heat as well. Non-porous tiles are another low-fuss option, just so long as you keep those seams to a minimum. If you love the softness of carpet, consider keeping it to lower-traffic rooms such as bedrooms or the study. And while hardwood flooring looks fantastic, it scratches easily and absorbs water stains – so avoid it in areas such as the kitchen or where the kids or pets play. Dust and grime have a habit of building up around areas that are close to the floor. Think bathroom fixtures and counters. Choose floating fixtures in your bathroom, kitchen and laundry to minimize dirt – and to make day-to-day cleaning simple. It’s much easier to run a broom or mop beneath a floating fixture than it is to clean around those nooks and crannies. Note that the opposite is true of kitchen cabinetry. If you can, avoid having a gap between cabinet and ceiling, as this just creates a hard-to-clean surface made for collecting dust. Carrying a vacuum cleaner up the stairs or getting into those hard-to-reach places is no fun. It’s just an incentive to put off that regular cleaning until you’re in desperate need of a deep clean. A central vacuum system is a simple solution to make whole-house cleaning simple and hassle-free. Plus, as a bonus, it extracts dust and grime and exhausts it outside – rather than circulating it back inside your house like a regular vacuum. Ample, well-planned storage makes it easier to keep things tidy and organized. 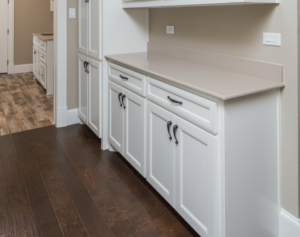 Built-in storage is the most seamless option, but you can also opt for mobile storage solutions if needed. Place them carefully: make sure they’re easy-to-reach and close to where you use the items you plan to store in them. You’ll spend less time picking up after the family, and less clutter means less dust and grime. There’s a reason we all love simple, clean lines. Because they’re simple – and easy to clean! When designing your home, opt for simplicity at every turn. Choose recessed light fixtures and consider plain, rather than ornate, trim. Opt for blinds and shades that are easy to wipe down, and join-free finishes. The same goes for outside: design a low-maintenance garden with pavers, gravel and low-water plants, and you’ll save hours on yard work. Housework is part of owning a home, but careful design can minimize time spent cleaning, tidying and polishing. You’ll save on your day-to-day tasks, and you’ll appreciate it when it comes time for that annual spring clean! Ready to start building your dream? Let’s chat about what you have in mind.